This is going to be a quick post about this restaurant I went to recently - it's called e11even, located in Downtown Toronto. My friend and I decided to stop by for lunch on a whim and I am so glad that I did. 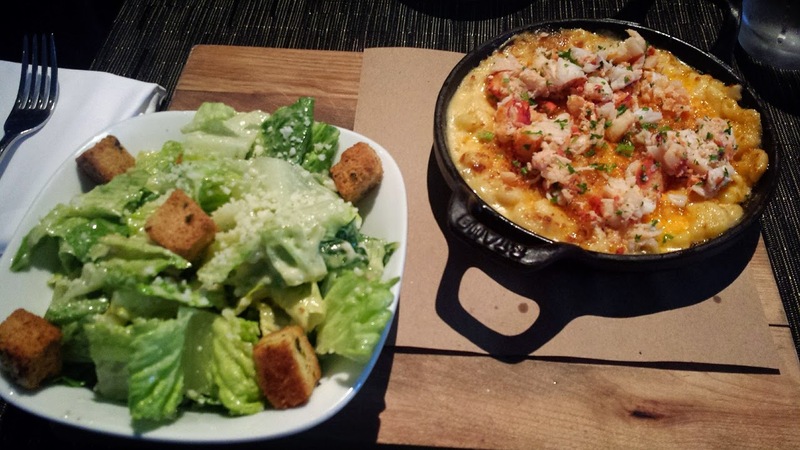 I have been on a hunt for a good lobster mac n cheese, one that isn't too rich and heavy or fishy tasting. The amount of lobster that they give you is generous and it's fresh and super delicious. They serve it on a cast-iron skillet and the cheese bubbles in front of you. I am the type that loves to add ketchup to my mac n cheese, yes to some of you its shameful, however - this was SO delicious that I didn't have to do it at all. It was perfect, it all it's cheesy lobster glory. I highly suggest that you go to eat it. In addition, the Cesar Salad wasn't too garlicky or the lettuce too big to eat, the leaves were fresh and crispy - really worth the price you pay. You're paying for quality here, and I would definitely come back to this restaurant in the near future. Omg, this looks incredible!!!!!! We have to go!